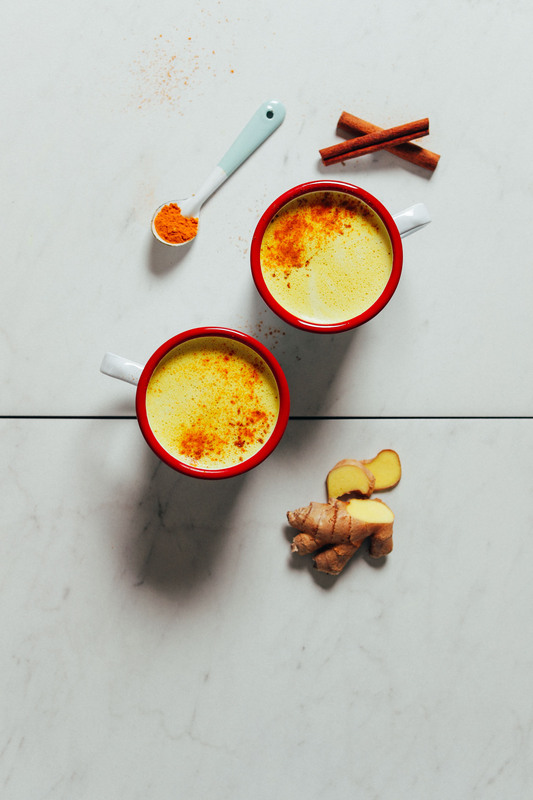 Golden milk is a health-promoting tonic that has its roots in the practice of Ayurveda. And this golden paste is made with just 7 ingredients and requires only 10 minutes to prepare. 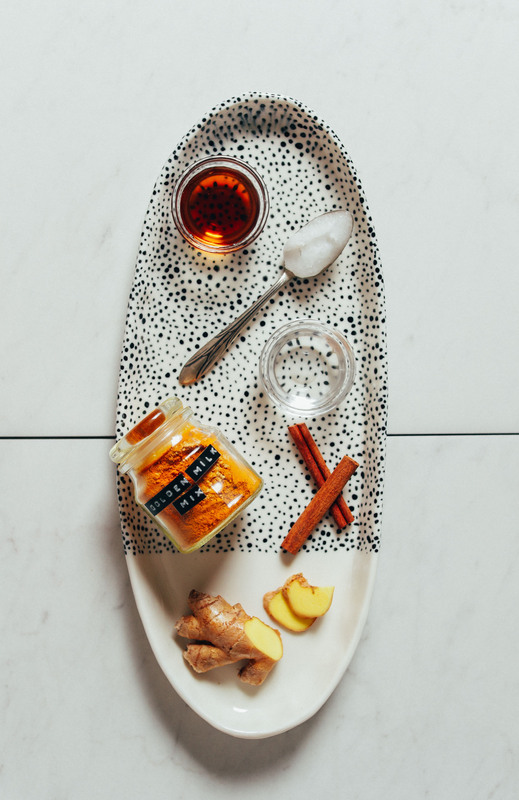 The paste uses the same spices as our golden milk mix (turmeric, ginger, cinnamon, black pepper, nutmeg, and cloves), but includes coconut oil, maple syrup for sweetness, and a little water to make a paste that blends effortlessly into your dairy-free milk of choice. And since it’s already sweetened, there’s no guesswork or sweetening to taste. Just heat milk, whisk in golden paste, and BAM — your golden milk latte is ready to enjoy! It’s perfect any time of day: a caffeine-free morning, afternoon boost, or comforting evening. If you’re into golden milk, be sure to check out our original Vegan Golden Milk, Golden Milk Smoothie, Golden Milk Macaroons, and Golden Milk Ice Cream! Crave golden milk but short on time? 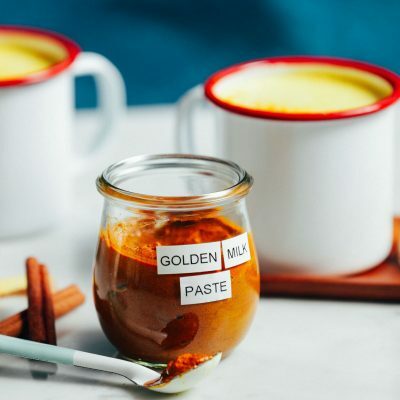 Try this 10-minute golden milk paste that puts creamy golden milk at your fingertips in minutes! Naturally sweetened, anti-inflammatory, and SO delicious. To make mix, add all spices (add-ins optional) to a small jar and shake or stir thoroughly to combine. Add melted coconut oil, maple syrup, and hot water (starting with lesser end of ranges) and stir until a paste forms. 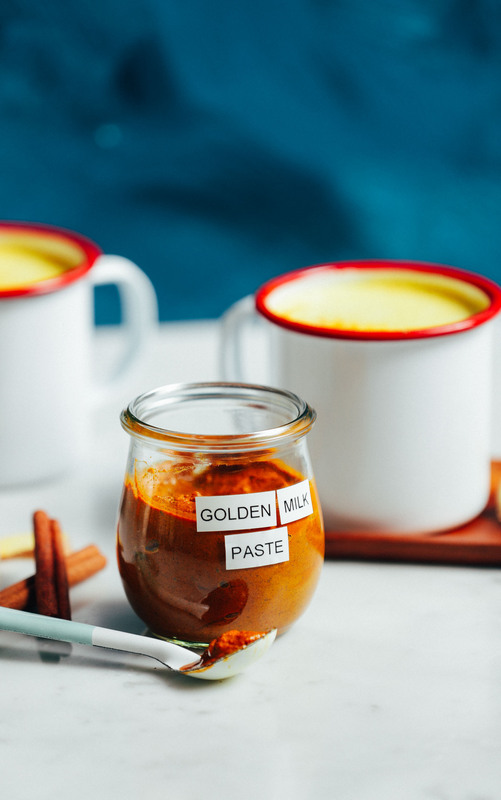 To make HOT golden milk, add 1 ½ tsp Golden Milk Paste and 1 cup dairy-free milk to a small saucepan and whisk to combine (amounts as original recipe is written // adjust if making more than 1 serving). Heat over medium heat until just hot/warm (not boiling). Taste test and add additional sweetener if desired. To make ICED golden milk, add 1 ½ tsp Golden Milk Paste and 1 cup dairy-free milk to a glass jar with a lid and shake vigorously to combine. Place several large ice cubes in a serving glass, then pour the shaken golden milk over ice before serving. Store paste in the refrigerator up to 1 month. Double the recipe if you intend to use it daily (it goes fast!). You can also store paste in the freezer by filling the wells of an ice cube tray according to your desired serving size. *Nutrition information is a rough estimate calculated for 1 serving of golden milk (1 ½ tsp Golden Milk Paste and 1 cup canned light coconut milk) with the lesser amount of maple syrup used in the paste and no extra sweetener added to the golden milk. 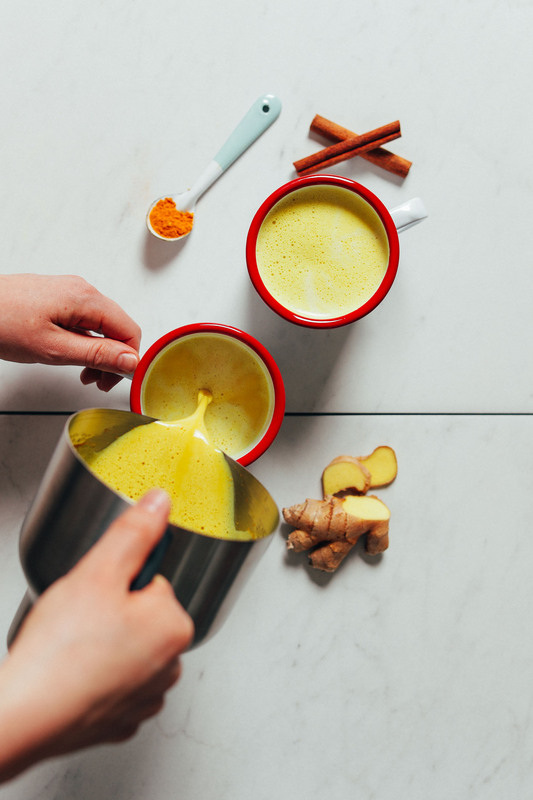 I love golden milk but only when made with fresh ginger and turmeric. I’ve looked online for a fresh recipe for paste but can’t find it. Is there something about the fresh ingredients that keeps one from prepping it ahead of time? Hi Gretchen, the fresh ingredients won’t last as long, but they might work! If you do some experimenting, we would love to hear how it goes! is it possible to make this paste from a whole fresh turmeric? Hi Liat, we haven’t tried that and fear it wouldn’t keep for as long as powdered would. It would have to be strained out before enjoying (which complicates the recipe). But if you do try it, let us know! We are not sure on the amount. alright. thank you for your help and great recipe! many blessings! I’ve only tried golden milk once and it seemed like so much work. When I saw this recipe I thought it’d be a great time to try it again. I followed the recipe to the T and then tried it with coconut milk. It was tasty, but then my husband suggested watering it down a little. I then tried it with just water instead of milk and prefer it more. It gives it more of a tea taste than a creamy consistency. I think I was wanting a creamy treat, but turmeric doesn’t really naturally lend itself to sweet unless you add a lot of additional sweeteners. I still want the benefits of it, though, so I’m excited to have tried it with water. This is nothing against the actual recipe, just my preference. Like I said, I’m happy to have found this recipe because it’s super easy to now have in the fridge and just scoop out a little for an afternoon cup of cozy. I love this drink! I like the fact it’s anti-inflammatory. I ran across your blog by accident and am looking forward to trying the recipes. Easy to make. I added 1/8 tsp cardamom. It’s delicious! Yummy!!! YOU ARE THE BOMB!!! Hi Rebecca, sorry for the confusion! We recommend using ginger powder in this recipe. Hope that helps! I tried the recipe on Minimalist Baker for Golden Milk and I liked it but I never made it again due to how time consuming and messy it was when I was ready to drink a cup of warm Golden Milk. 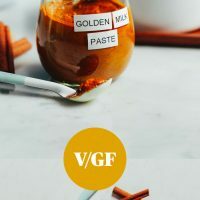 I was thrilled to find this recipe for Golden Milk Paste! I made it up ahead and when I wanted to have it, it was ready in an instant with no mess! I know there is a lot of great medicine (anti-inflammatory) in these ingredients, so that’s my first reason for drinking it. I was delighted to find it tastes so good and be so comforting. I highly recommend this recipe. I just made this but for some reason it turned into a crumbly powder instead of a paste. I did follow your recipe exactly. Any ideas what went wrong? Thanks so much, I love the idea! Hi Delyria, it sounds like you needed more liquid (either maple syrup or water). Hope that helps! Saw this on my instagram feed this morning and decided to give it a shot. I’ve tried other golden milk recipes before I never liked them enough to make them more than once. This combination of spices is just perfect! Will make again 100%!!! Lovely, thanks for sharing, Ashley! This recipe is so easy and so delicious. I used pumpkin spice in replacement of the nutmeg and it worked perfectly. I can’t wait to make this recipe again and again. It definitely will become a staple in my house! I paired it with oat milk and put it in my milk frother. Heaven! Excellent! made it with Soy Milk in place of coconut tastes beautiful. I’ve been looking for something like tea to have in the afternoon while trying to cut back on caffeine so this will be the replacement for at least one cup. Yay! Thanks for sharing, Sharon! Thank you for this recipe. I know I’m going to prefer the paste to the dry powder mix. As I was making the paste I wondered what it would taste like if I added my dried ground oranges as the sweetener if there was no maple syrup in my cupboard. 🤔 Added it to my homemade cashew milk. Love it! Delicious and easy to make. My 5 year old helped me measure the ingredients. We made golden milk with the paste and the whole family loves it! Yay! So glad you enjoyed it. Next time would you mind leaving a rating? It’s super helpful for us and other readers. xo! Just made this and it’s super yummy. Thanks for posting this! Usually don’t like coconut milk but since I had it for a prior recipe, I tried it and love it. And I’m not even vegan. I agree with a previous commenter that something similar for matcha latte would be great. I keep wanting to make a matcha latte but time is of the essence. I love that idea! Will add it to my list. Also, next time would you mind leaving a rating with your review? It’s super helpful for us and other readers. xo! I have made a few different recipes of golden milk but I Love this one. Thanks for sharing. I had never even heard of golden milk but this sounded good and I already had all of the ingredients so I just gave it a try using oatmilk to make the drink. OMG, this stuff is amazing! Thank you SO much for posting this recipe. My mom used to make this for me when I was a little girl. It’s nice to see Indian remedies and ingredients now being more accepted and mainstream but i don’t want people to forget where recipes like this have come from. I used to get made fun of for eating curry and hid a lot of the food I ate from the people around me because i did not want to be the subject of misplaced curiosity or jokes. Thank you for the reminder! We will add a note, Meera! Just made the mix and haven’t tried it in a drink yet but I can’t wait! I love the concept of this recipe and how it makes it so much more convenient to make golden milk frequently. I would really love to see the same type of recipe for a matcha latte! Thank you for the lovely review and suggestion, Ellen! We will add it to our ideas list! Looking forward to trying this! Great job! This was very tasty. Not a big fan of ginger, but the way the spices work with each other makes this drink taste balanced, creamy and earthy; I love it! I even had my mom and sister try it and they love it too. Can fresh ginger be used as substitute? Hi there. We haven’t tried that, and I fear it wouldn’t keep for as long as powdered would. Also, it would have to be strained out before enjoying (which complicates the recipe). But if you do try it, let us know! I’m not sure on the amount. Do you store the paste on the counter or in the refrigerator? Never mind! I found the answer in the instructions. 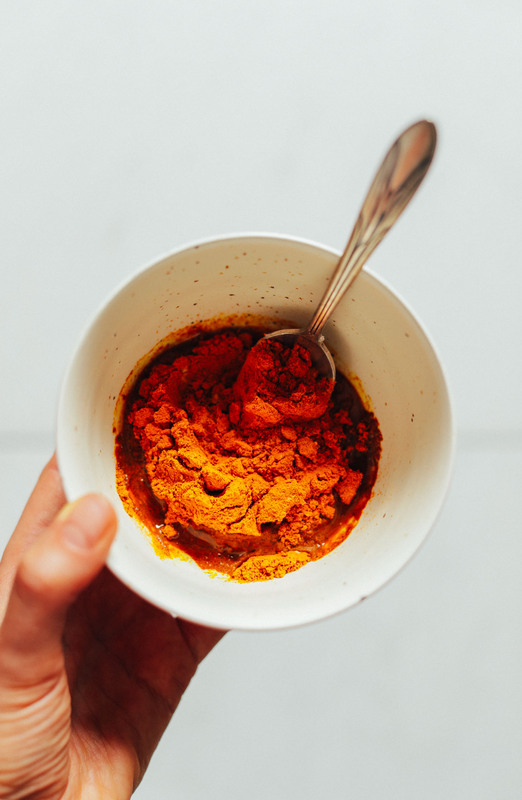 Would it be possible to use fresh turmeric? If so, how much? Hmm, we haven’t tried that. I fear it wouldn’t keep for as long as powdered would, and it would have to be strained out before enjoying (which complicates the recipe). But if you do try it, let us know! I’m not sure on the amount. I followed carefully your recipe. I’ve checked the colors of your spices and mine, both are the same color. At the end, mine is more brown than yours which is more orange. I’ve used coconut oil melted. If it’s just the color, you’re good! Depending on the brand of spices and any adjusted quantities, yours may just be darker! Mix it with your milk of choice and it should be deep golden yellow. Super tasty! Made it with soy milk. Added a few drops of stevia. There’s no reason I can’t have golden milk everyday now! Thanks so much for another great recipe! Do you use fresh or powdered ginger? Powdered – to clarify all of the spices are powdered (nothing fresh). Sounds delicious. I’ll try it, but in regular milk. Whole and fresh from the local dairy. Hope you enjoy it, Suzan! Thanks M! Next time would you mind adding a rating with your review? It’s super helpful for us and others readers. xo! I love the idea of consuming the ingredients in golden milk but I can’t get myself to drink any kind of milk, although I do cook with milk. Is there any other way of consuming this golden milk paste besides in a drink? Hmm, you could add it to porridge, oatmeal, smoothies, and probably baked goods (add to the wet ingredients to infuse your batter golden!). Haven’t done it yet, but pancakes sounds like a winner!! !